"No more silence, no more violence!" students shouted as they marched across the Indiana State University campus during the "Take Back the Night" event. The event focused on raising awareness of gender based domestic violence with the slogan, "No Excuse for Abuse." Every year, students put together the Take Back the Night event on the ISU campus for their women's studies class. "I know someone who was a victim of abuse," said Nia Jackson, sophomore biology major. "I think everyone should be knowledgeable of the issue. It's a serious matter." She said. Take Back the Night is an international event, which includes marches and rallies that have taken place all over the world since 1976. 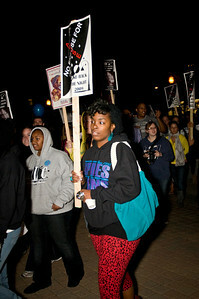 It advocates taking a stand against domestic abuse while marching fearlessly through the streets to reclaim the night. "This event sheds a positive light on the university and it raises awareness for gender based violence," said Scott Harlan, a senior political science major. ISU students gathered around the Dede Plaza to raise awareness. There were informational booths about domestic violence, sexual abuse and assault. The featured speakers were ISU President Dan Bradley, activist Josh Philips, and sexual assault therapist Hailee Lauritzer from Relief after Violent Encounters in Michigan. Before the rally activist Josh Philips spoke to students. "Sexual violence happens because culture allows it. We have created a predatory culture," Philips said during an inspirational speech in Cunningham Memorial Library. After the rally, students marched across the ISU campus shouting chants such as, "We are women, we are men. Together we fight take back the night," and "Two, four, six, eight, stop the violence stop the hate!" The night ended with a candlelight vigil at the Dede Plaza and students took a pledge to speak up against domestic violence and not act as silent bystanders. ISU students raised awareness of domestic violence during the annual "Take Back the Night" event Nov. 12.